Anyone know of any local to Cheshire, Independent BMW garages that can diagnose the triangle fault that's just come up on the dash. Need it sorting pronto as I'm away in Spain next week. Is there a message or code in the display? 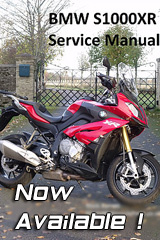 As someone who has spent the last two weeks disembowelling a K1200 and realised while the bike may have been around since 2004 there ain't half the info you think there is out there and that's after all these years so I sure as hell wouldn't be looking at an independent at this early stage in the game with an XR just to try and save a few bob. Do you know where the dynamic Pro plug is? Pull it out and start the bike up and let it run for a minute turn the bike off wait a couple of minutes and put the plug back in start the bike again. If that doesn't work it's either the dealer or a very kind gent with a GS911 pro cuz if it's the cheapo version he'll be using one of his 10 lives entering your Vin number on his device. I didn't notice any text, but that doesn't mean there wasn't any, and since I can't get to my bike till tomorrow night, I'm left guessing. However, one of the reasons for the light, is a service reminder, or to be more precise, to tell you the service anniversary has passed. So I checked my last service date, and it was 2 days prior to today. Coincidence? I'm hoping this is the cause of the light. The bike is not up for service miles-wise, but isannually, and I had sorted to get it done on my return to the UK. I'll check tomorrow night if it says "SERVICE" in the display. Might be the yearly service reminder. When you switch the ignition on does it display as service due message on the screen? Yes it does show this, and has done for a few weeks, which is what prompted me to arrange the service, BUT I was going to do it on miles rather than dates (which would only be a few weeks difference anyway). Then yesterday, the warning traingle came on, but I didn't look for any messages, which there might well be! I'm hoping it says "SERVICE", but can't check till tonight !